Runners at the starting line of the annual Santa Run. Photo courtesy of San Diego Running Co. This pre-holiday weekend offers a convention for pet owners, a 5K run for athletes in Santa attire and the classic Parade of Lights on San Diego Bay. It’s a convention for pet owners, bringing owners and veterinary professionals together. This weekend at Wag PetCon, pet owners can learn about their furry companion’s behavior, nutrition, pet enrichment, allergy management, senior care and more from veterinary professionals. The event also showcases new products and services, such as foods, treats, toys and grooming services. Vet+Pet West Wag PetCon goes from 10 a.m. to 6 p.m. Saturday and 10 a.m. to 4 p.m. at the Convention Center. Tickets range from $5 to $15. It’s a one-of-a-kind holiday experience in San Diego. 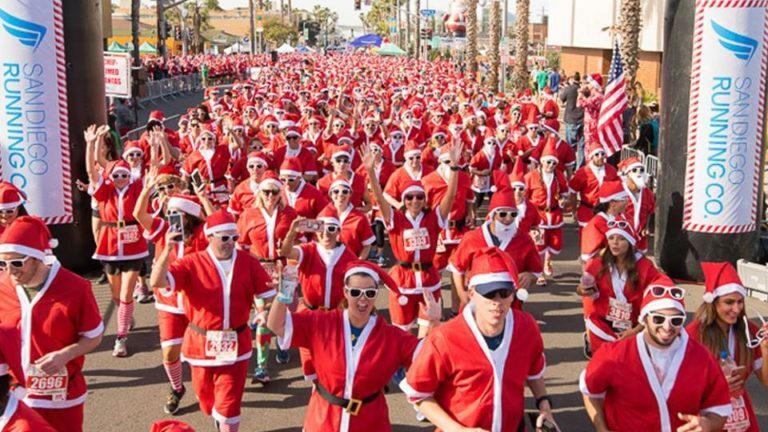 Participants are encouraged to come out in their Santa Suits, hats or other holiday attire for the annual San Diego Santa Run. The event is a series of runs on Garnet Avenue, including a 5K run, 1-mile run, pets run and kids run. Afterward, participants are encouraged to stay for the annual Pacific Beach Holiday Parade. The event starts at 8:30 a.m. Saturday and is free to watch. There is a $45 registration fee to participate in the 5K run, $25 for the 1-mile run and pets run, and $25 for the kids run. A Santa outfit is included in the 5K registration fee. Everyone loves model trains. It doesn’t matter how old you are, model trains still bring a child-like fascination. This weekend the San Diego Model Railroad Museum is partnering with local breweries for a beer tasting and ugly holiday sweater party. Participants and enjoy all of the museum’s exhibits and sample brews in an intimate setting. Ales N’ Rails goes from 6 p.m. to 9 p.m. Saturday. Tickets are $25 general admission and $60 VIP. If you missed last weekend’s Parade of Lights, here’s another chance to catch the decked out boats, yachts and dinghies. This year’s theme is “Tropical Island Christmas,” so picture Margaritaville with holiday lights. The parade starts at Shelter Island then continues to Harbor Island, the Embarcadero, Seaport Village the Pier at Cesar Chavez Park and ends at the Coronado Ferry Landing. The best viewing locations are Seaport Village, Harbor Island and Shelter Island, though parking spaces at those locations fill up quickly. The north and south ends of the Embarcadero and the pathway along Coronado tend to be less crowded. The San Diego Parade of Lights starts at 5:30 p.m. Sunday and takes about an hour from start to end. The rink is one of the biggest in Southern California. Viejas Out Center claims the rink is bigger than the one in front of Rockefeller Center in New York City. Viejas Ice Rink typically opens from 5 p.m. to 10 p.m. on weekdays and from 3 p.m. to 10 p.m. on weekends. Tickets are $16 for adults or $14 for children 12 and under. If you plan to visit several times this season (the rink opens until January), you can buy a season’s pass.